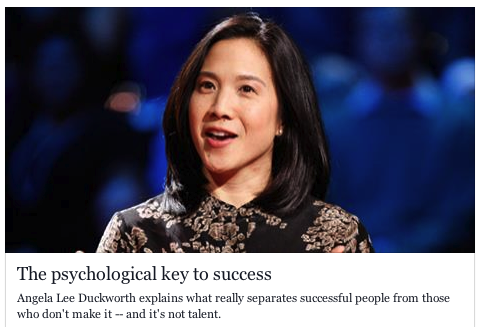 I've always enjoyed hearing stories of success! I've listened to many motivational speakers read books on how to succeed but when it comes down to it, it's about having a vision and hard work! Have you heard of the formula VISION + SWEAT = VALUE square? I was introduced to this formula 20+ years ago and still believe it today. Each person has a gift in life, you must find out what is your God given gift and share it with the world! Your passion with perseverance with let you finish the race well. That's my word for today:) What is GRIT? CLICK HERE! Everybody's talking about it! Don't forget to watch OC16 Tues April 1st at 8:30 pm Channel 1012 or 12. Today we had an opportunity to give the news a story for tonight and tomorrow am. Wendell Ko setting up to tell his story about his big catch. 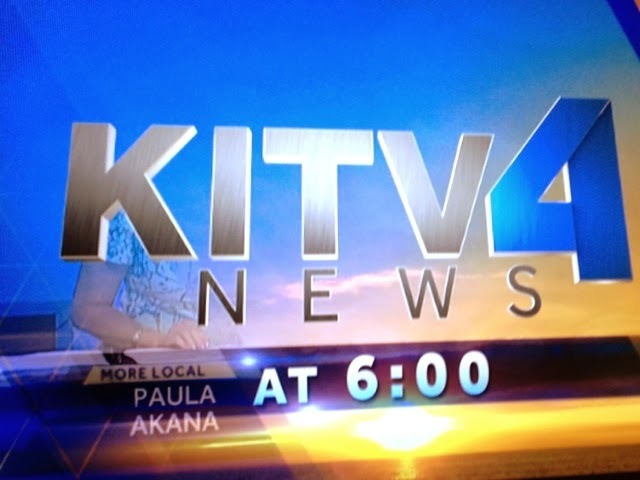 It will tonight on kitv4 news at 6 and 10. We also did a radio interview with mike buck for his go fish segment to air 6-7 am on KHNR 690 AM. 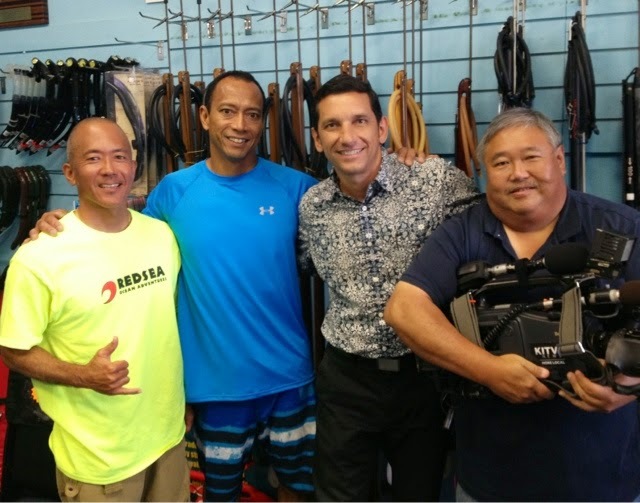 Was a great time meeting Andrew and Bob from KITV4 and they did a great job! 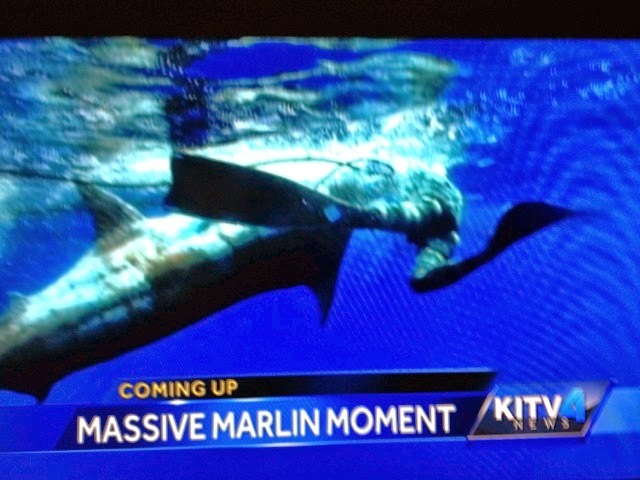 KITV4 Story online CLICK HERE! After the interview I passed by diamond head and it was going off! 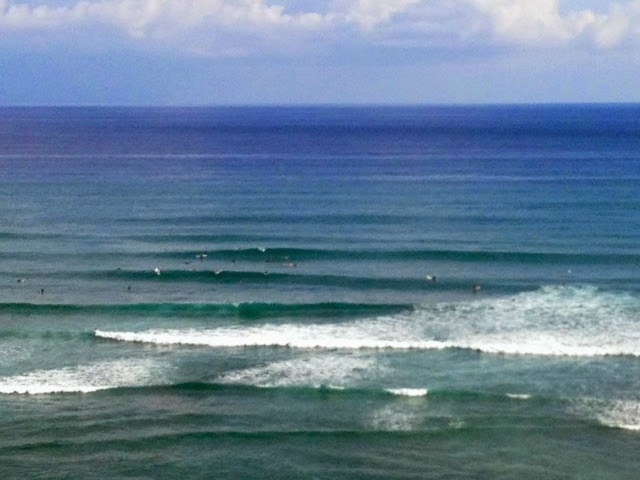 Head high sets, long walls, no wind and no crowd! 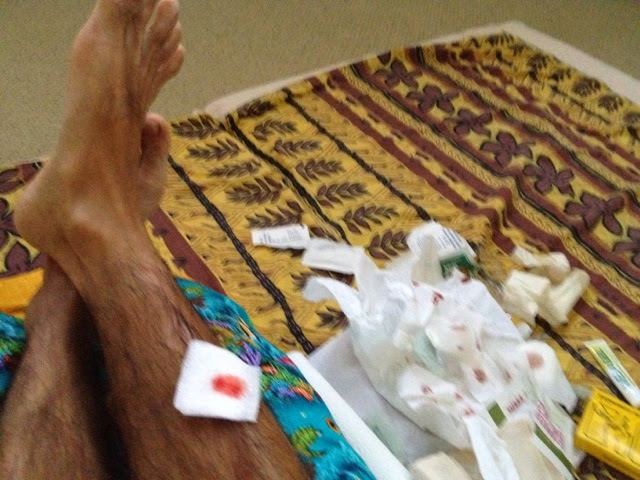 Lucky I keep my board in my car so waxed up and got some fun ones for pau hana Friday. What a nice day it was today. 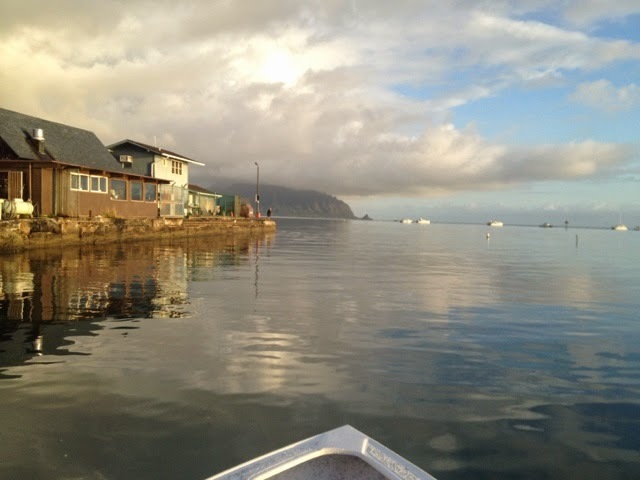 Winds backed off so wanted to check out the east side and run my boat before ahi season starts up. Al Ah Née and I put out a few lines and got three strikes before we were out of time. Oh well better luck next time. This has to be one of my top 10 views. 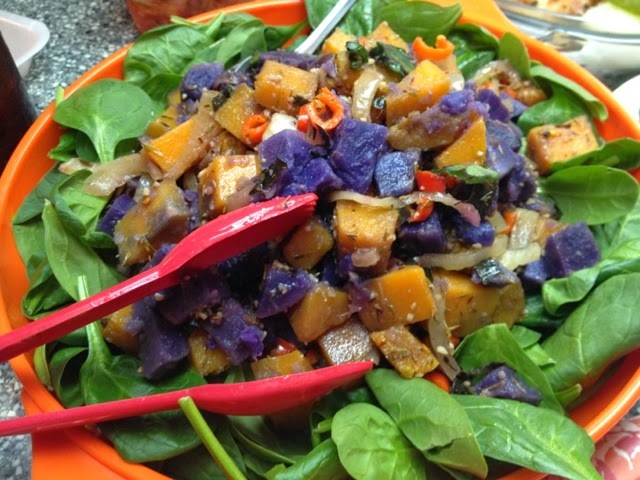 To top it off Al made this awesome salad with spinach, sweet potato, squash, thyme, onions, bell peppers. Thanks Al for the terrific grinds once again! 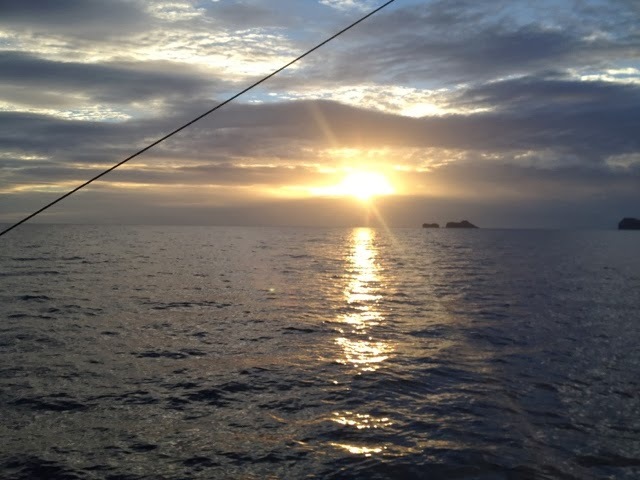 Let's Go get some big ahi next time! 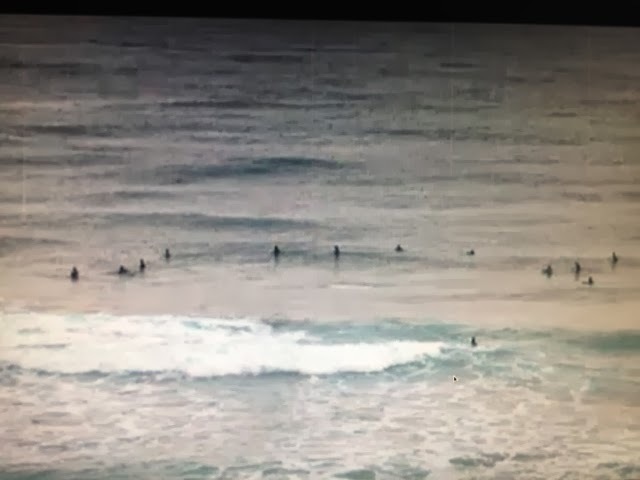 Was checking the surf this evening on the cams and never saw this surf spot before. 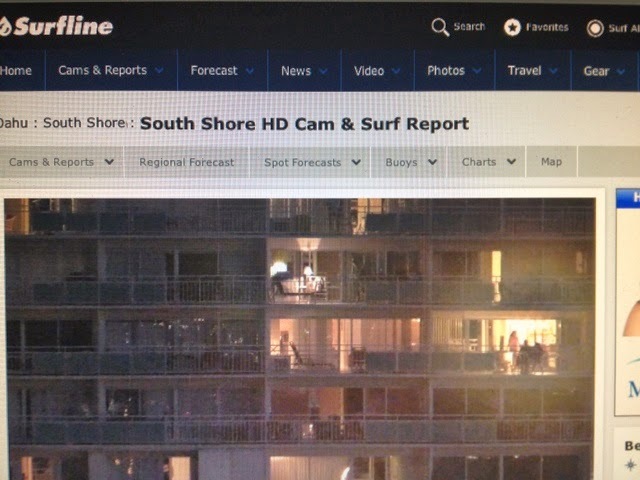 Wow some hacker rotated the cameras so it focused on some apartments at the ilikai hotel. Imagine if you were in one of these apartments at the ilikai? 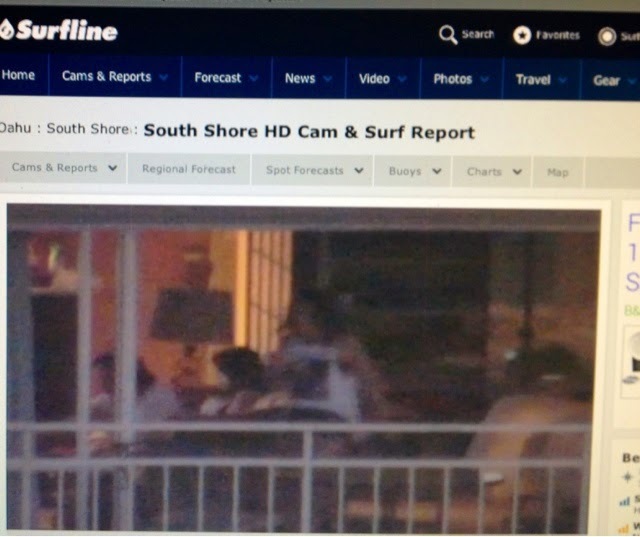 Looks like someone is making waves for surf line this evening. 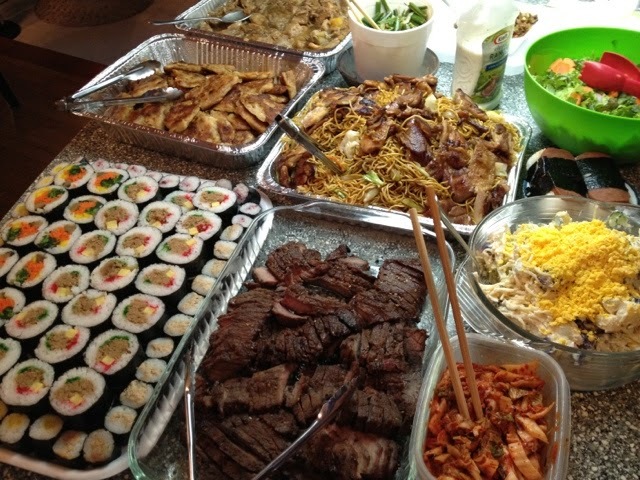 And this spread from nakamotos grill. 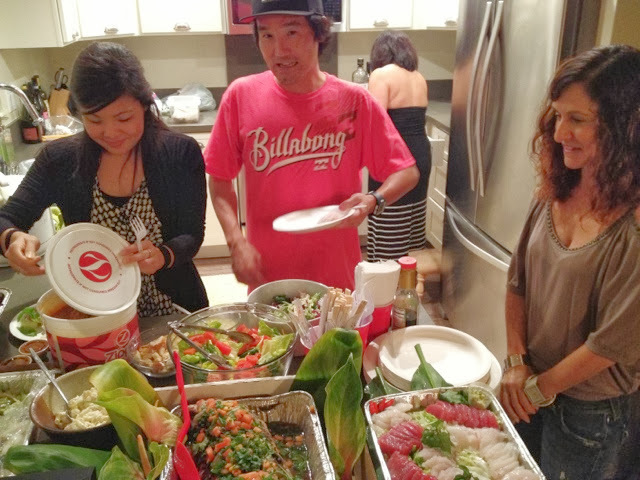 This is Ono Kine grinds. Ended the weekend with some fun surf with 4 guys out and a spectacular sunset! 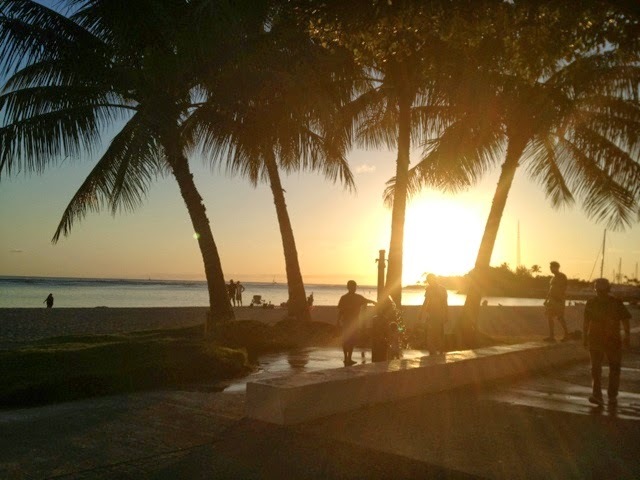 Can't wait for another aloha Monday! Been a busy week editing another exciting episode of Hawaii Skin Diver. 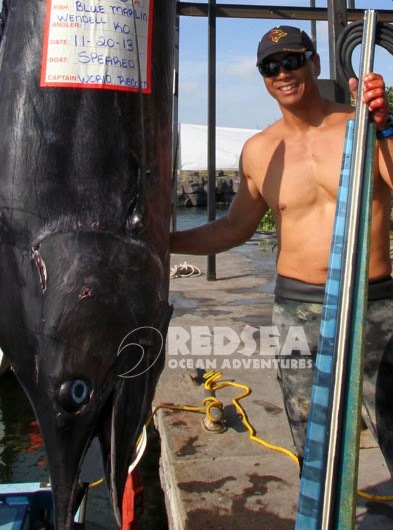 Next month we are featuring the biggest fish ever speared in Hawaii and a new world record blue marlin taken by local freediver, Wendell Ko. Ask anyone, and they will tell you how much they respect Wendell Ko. 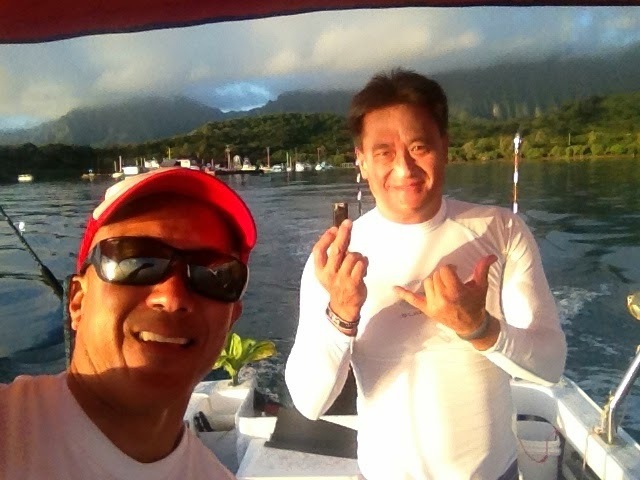 He is a legend by many and one of the greatest divers and fisherman I know. 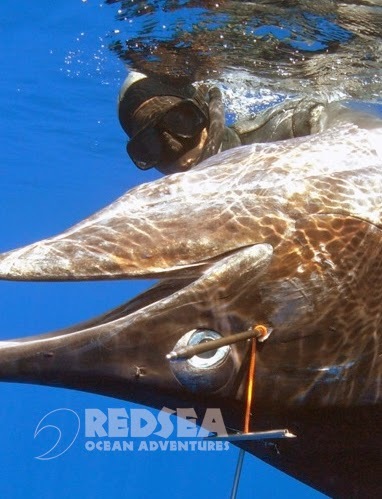 His passion for catching fish whether by spear or by pole is contagious! His humble attitude toward reaching personal bests is evident by many awards and trophies. Watch this exciting episode of Hawaii Skin Diver at 8:30 pm, Tues. April 1, on OC16's channel 1012 or 12 and see all the action! And that's no joke! We started editing the "big fish" episode and still amazed at the footage we got on this trip. 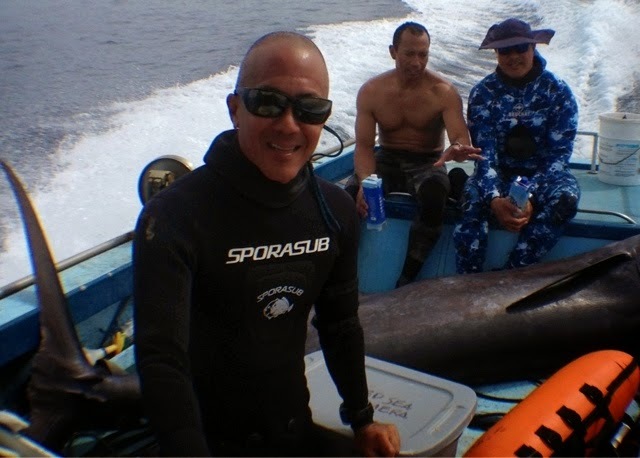 Its not everyday we see big fish but were fortunate to have captured this moment for Wendell Ko and his buddies Puna Apio and Ernie Ripley. The fish was so huge it didn't even fit in my camera shot. 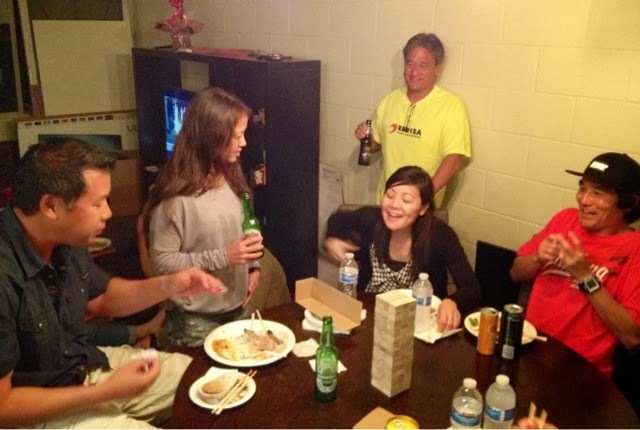 Stay tuned for more of Hawaii skin diver! 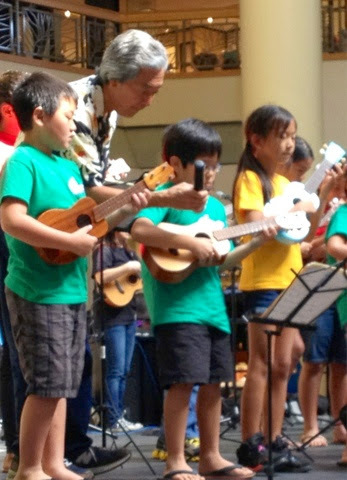 This weekend we got to watch my nephew jam his ukulele at the Roy Sakuma performance. 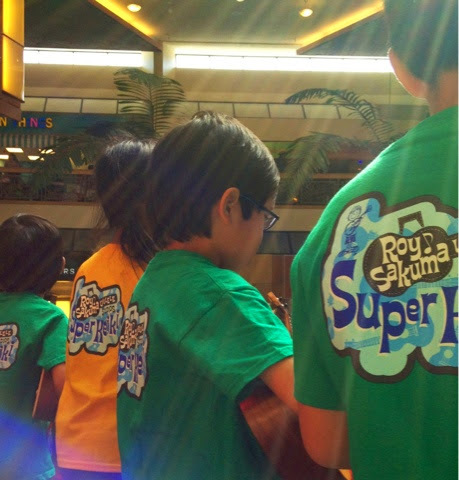 Here Roy is focusing his mic on Maika! If you are not afraid to jam on stage or speak in public you will go far. So often kids don't like to try new things, afraid to get their hands dirty and rather play their video games instead of learning new things. Zig ziglar said, you don't have to be great to start but you have to start to be great. Got a call from Mike Hatcher, your blue water gun is ready! Jumped in my car and headed to meet him at Hanapaa Hawaii for pick up. 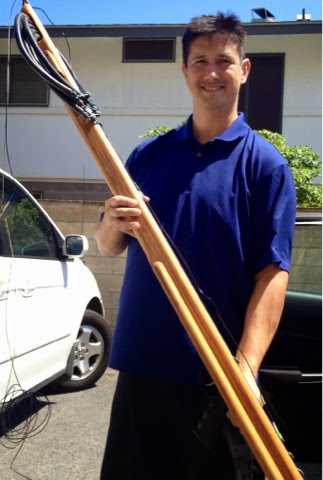 Hatch custom spearguns is a proud sponsor of Hawaii Skin Diver TV and mike can make guns to suit your needs. If you want a reef gun, roller gun, or blue water he can do it. 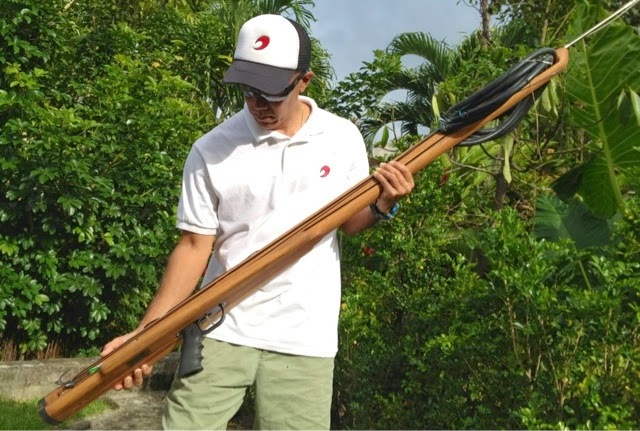 This is my first custom speargun. 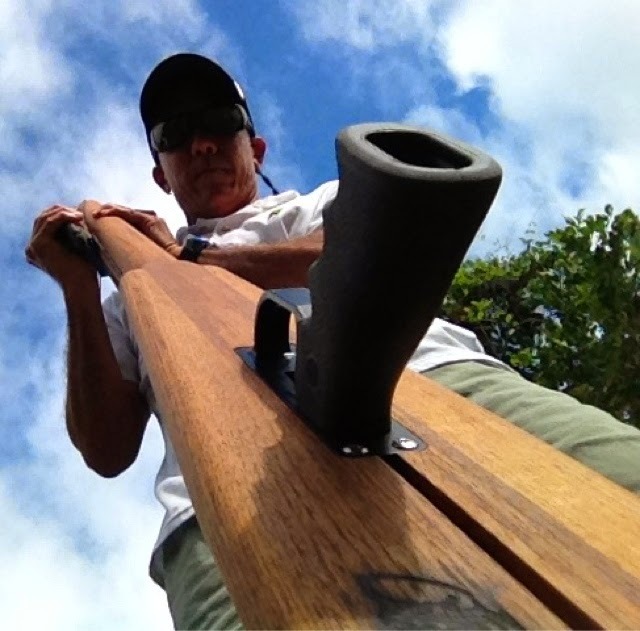 This gun is made of teak and has 5-bands, 3/8" shaft with an enclosed track, tricked out wings and weighted to 15 lbs. with a military type handle. It's important to have the right equipment and tools to do the job. Its like surfing...having a big gun for big waves is a must. Having a big gun for big fish is a must! I'm super excited to test it out before our next trip so when the weather clears up, you will know where to find me. 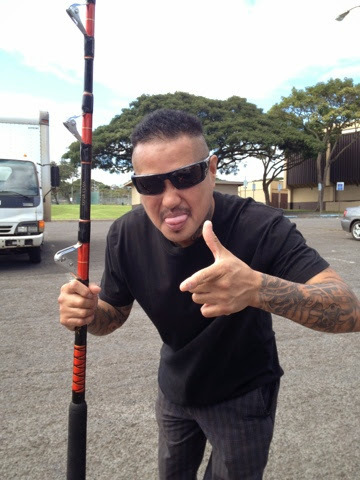 Mahalo Hatch Custom Spearguns! What to do on windy day? What to do on windy day with junk waves? 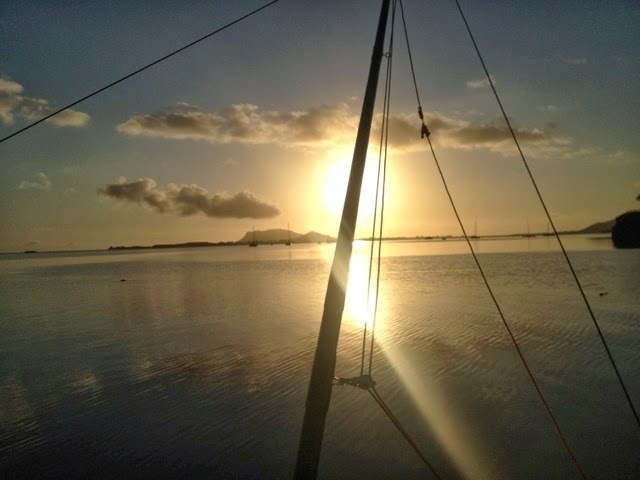 Answer: Prepare for flat calm days on the boat. 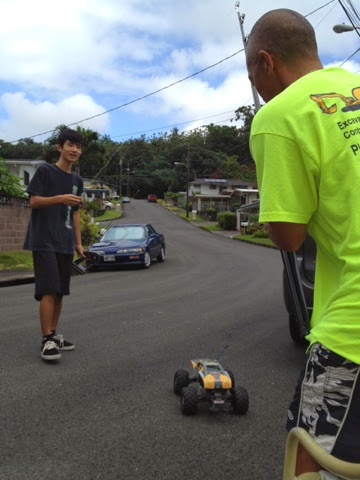 My neighbor Reyn Honbo here helping me mark lines using his remote control car. Instead of running up and down the hill 6x let the car do it. Thanks Reyn for helping me today. Collided with a beginner longboarder who wasn't watching and fell in front of me. Luckily only bloody and not broken. Saw this nice fishing 130 class trolling pole for sale so met the seller, he gave me his sales pitch and price, told me some stories, then I made an offer, and sold! Doesn't he look like a good honest salesman? Good thing he wasn't holding up a real gun! 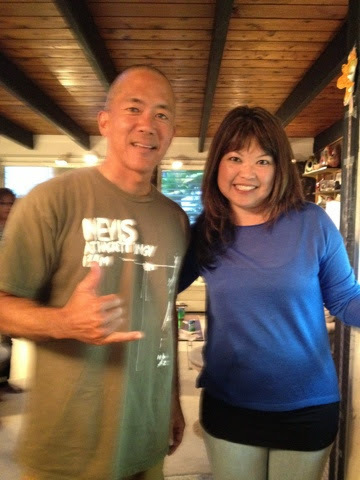 He even knew my friend James Oshiro and did an impersonation of James too. I'm excited to see some bloody decks on my boat with this pole this year. 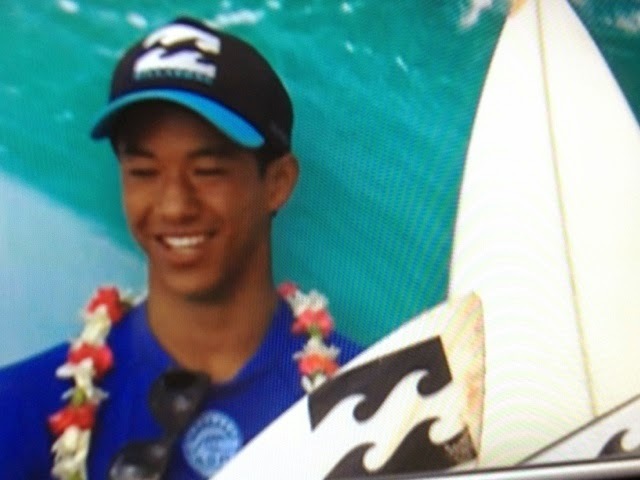 Congratulations to Seth Moniz for winning the pipe junior pro 2014. 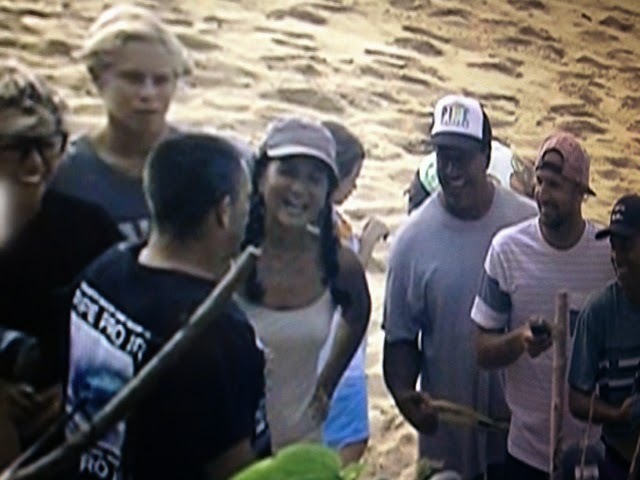 He's been putting his time out at pipe and well deserved win. Also congrats to Isaiah for placing second. Tony and Tammy must be so proud! If you want to raise waterman, take notes from the Moniz family. Surf in town awakes with some head high sets. Super blue skies, trade winds and hot days feeling like summer is near. See ya in the water! Well it was time to take my boat in for service check up. Called up Paul at bayside marine and met Jason Acasia for my tune up. Both of us were feeling little under the weather but we managed to make it through the day. 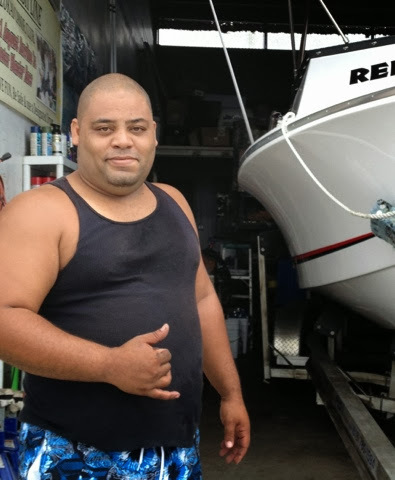 I'm so thankful to have an awesome mechanic to look after my boat. Now we are ready to land the "Big One"! We had a nice BBQ with some friends at Lena Chings new pad. Cecile, david, and Lena reminiscing in the kitchen about our last boat trip to indo. Congrats to trisha (left) and David (middle) on their upcoming wedding and addition. Jenny admiring the awesome spread of food! 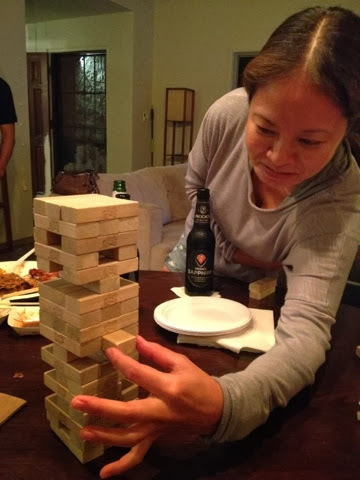 We had a couple matches of jenga before things got ugly. Teri hoe showing off! Check out that concentration after a couple of beers. Rest of the gang cruzing at the round table. 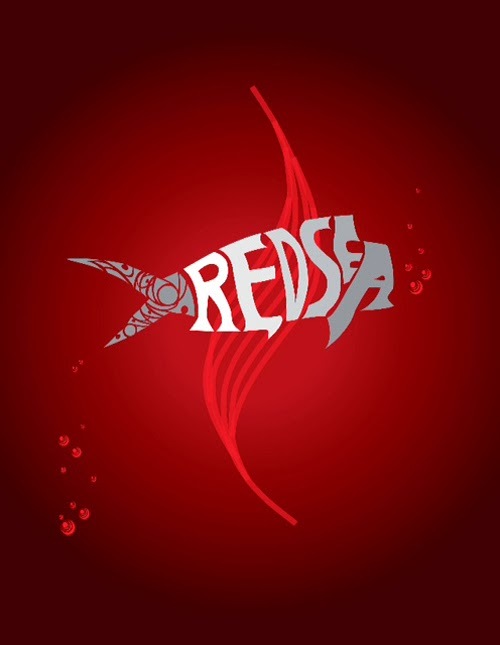 Great seeing everyone and look forward to many more Red Sea trips together. Thanks Lena for the invitation and congratulations on your new home. Best Lunch on the water! 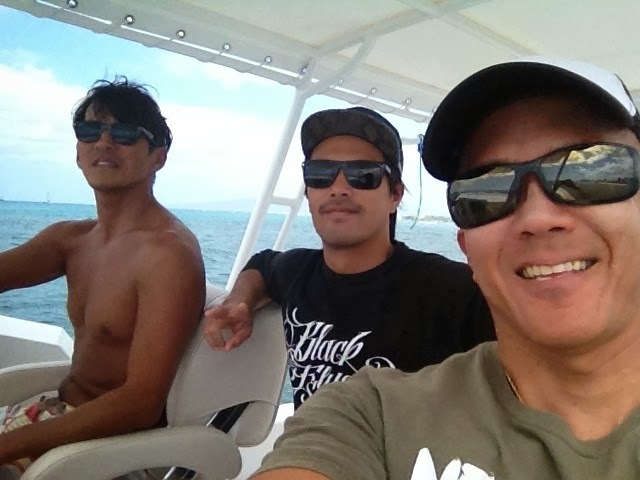 Today started off super nice as Kekoa, Al and myself went for a boat ride. 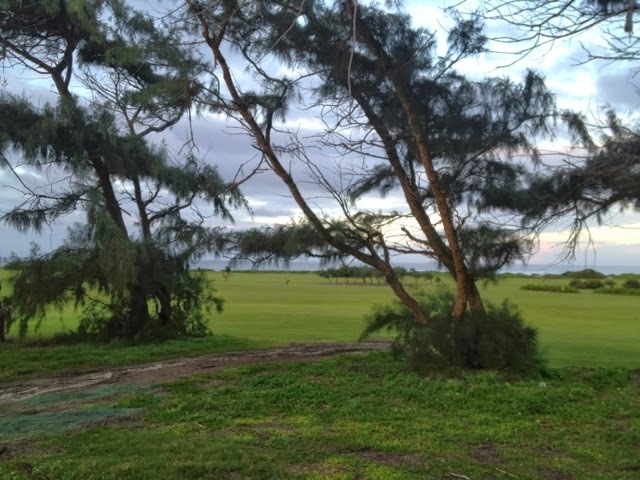 Winds were westerly but later switched north. This is Al's famous gourmet sandwich! 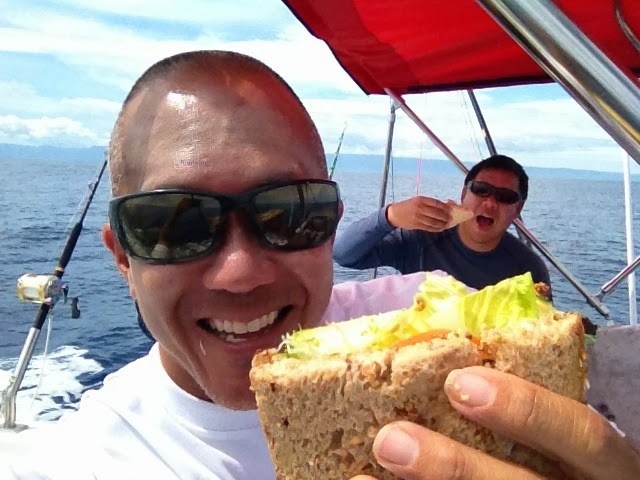 Super Healthy and Ono, we always look forward to eating lunch on the water. We got some sash for dinner and made it back home safe, it was a good day! Thanks guys for being an awesome crew. 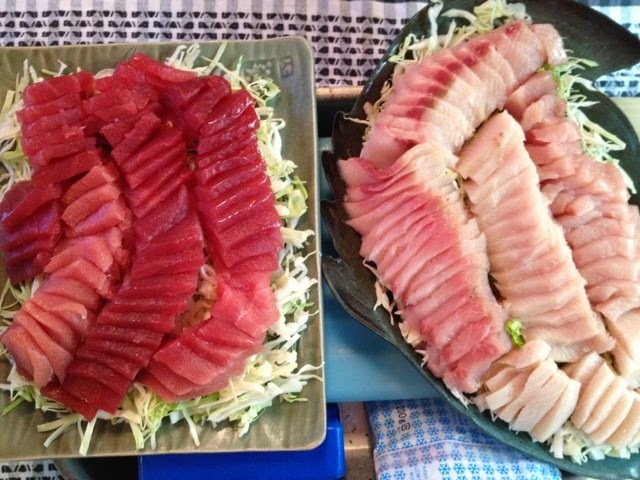 Looking forward to catching some big ahi this year. 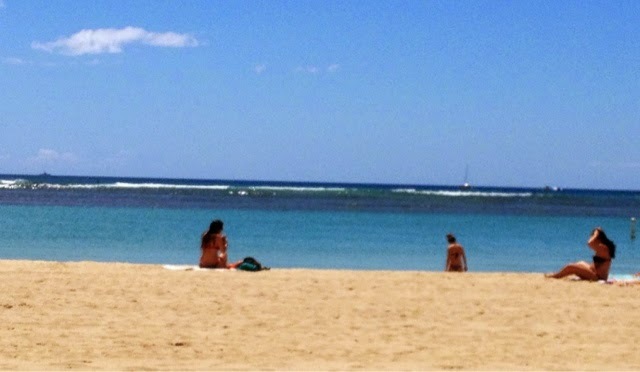 What a nice day in Hawaii! Went on Kirby's boat to explore some new secret spots. 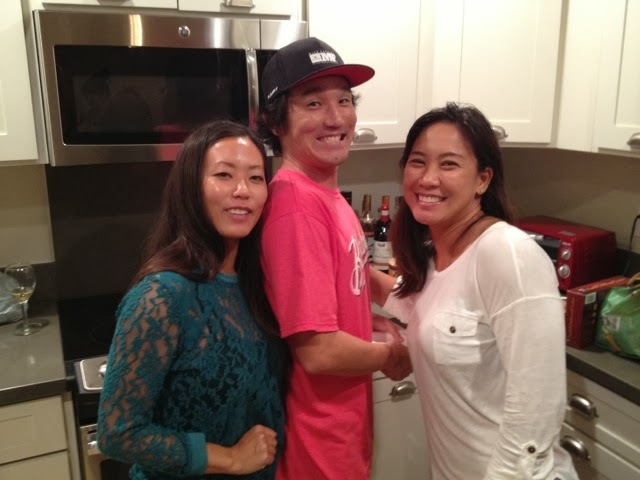 Our friend hayato maki is in town and it was great to see him. I like trying different places and we scored big time! 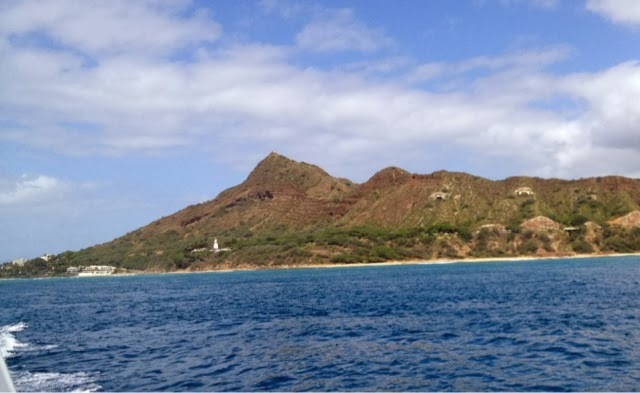 Passed diamond head and it looked so green on the mountain. 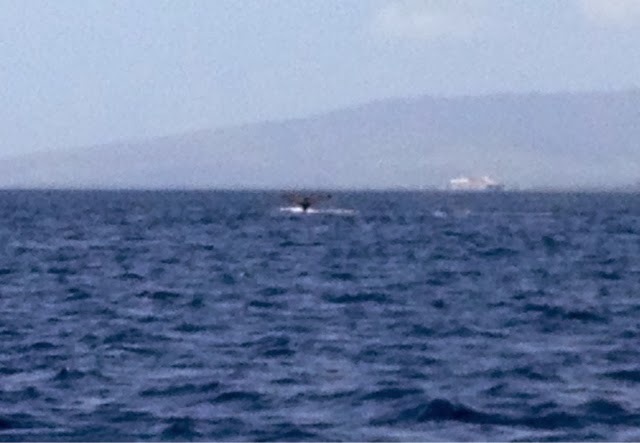 Saw some whales on the way about four of them. 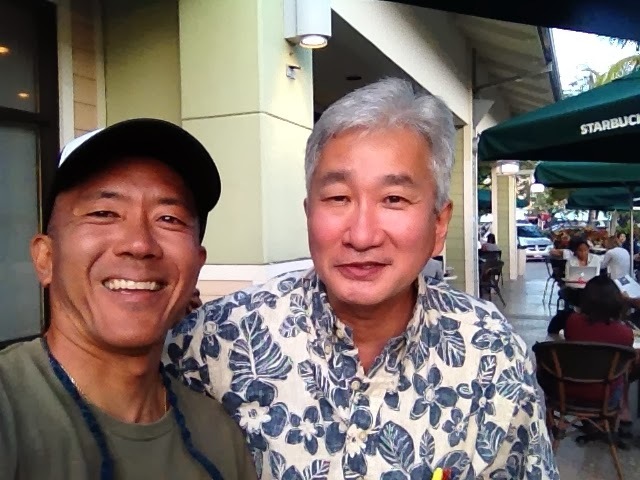 Had a meeting with professor yoshinobu ota who is here in Hawaii for some research. We will do a future hsd show with him some day. Thank you yoshinobu for the omiyage. Then saw a spectacular sunset on the west. 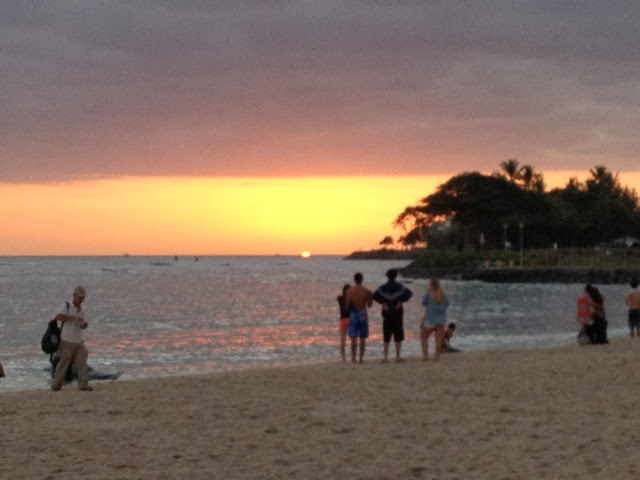 So lucky we live Hawaii! Check out this cool artwork created by my cousin Terry Onumaʻs teenage son Jeffrey for his class! Thanks Jeff, keep up the great work! Swell is here! 20 ft 17 seconds on buoy! I pull up this afternoon and see a few guys looking but nobody out. Huh? I wax up and find myself alone in perfect waves. I thought i was in indo or some remote destination. Then one by one more guys come out and by sundown 10 guys were out. Everyone got some nice waves today! I'm always watching the weather conditions wherever I go. It seems interesting to try and predict and forecast what the winds and waves will do on a given day. I think I should be a weather man on the news? 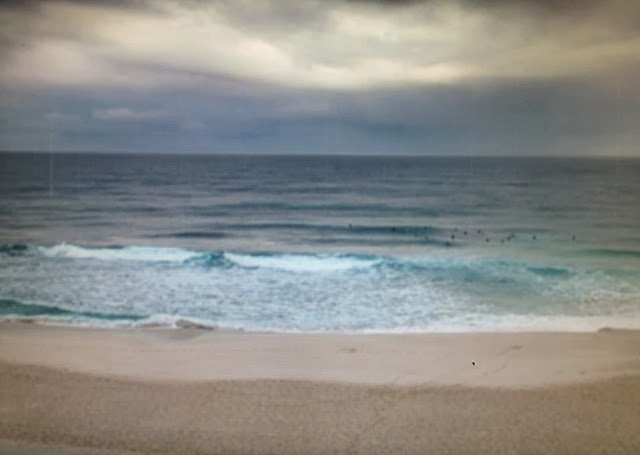 700 am surf check, tiny waves up north. Winds light southwest switching west later. Waves should be rising throughout the day and double to triple overhead by sundown. Winds will switch to the northwest on sunday and back to trades by midweek before another front appears end of the week. Surf safe everyone!